We awoke about 6:00am after a good night’s sleep and headed for the dining room to see what breakfast had to offer. The breakfast was served buffet style with pressed coffee or tea, omelets to order, local soup, sweet rolls, breads for toast, cereal, fresh fruits and more. It was beautifully displayed and everything was fresh and tasty. After a short cruise about eight miles down the river we arrived at the town of Mingun. We walked through the village of Mingun where we saw how the local villagers lived. We stopped to admire a large, unfinished pagoda or stupa built in the year 1790 by King Bodawpaya. It was not completed because an astrologer claimed that if completed the king would die. If completed it would have been the largest in the world at 490 feet in height. The king had hired 7,000 workers responsible to each make 300 bricks a day. This massive structure is made of solid bricks as compared to a hollow structure filled with soil. The stupa was badly damaged in an earthquake in the year 1839. It is believed that the structure is comprised of some 22-million clay bricks. 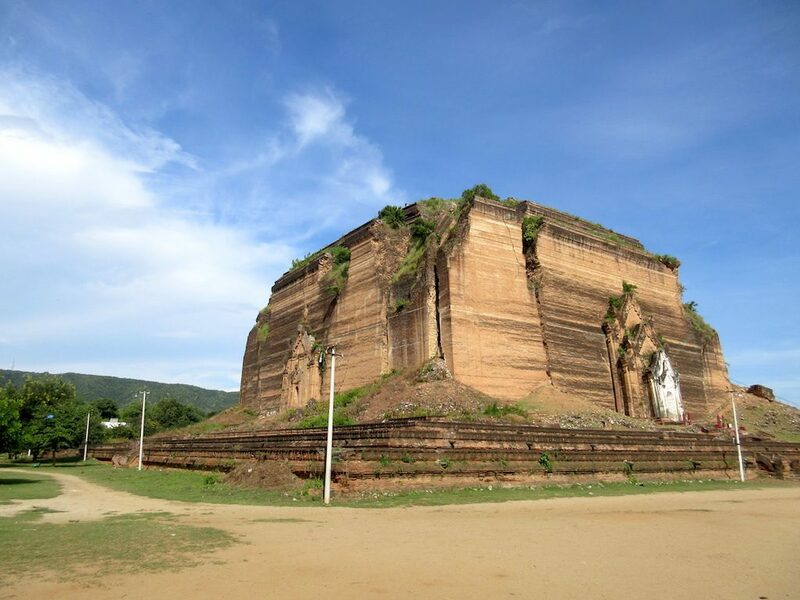 King Bodawpaya also had a gigantic bell cast in 1808 to go with his huge stupa. 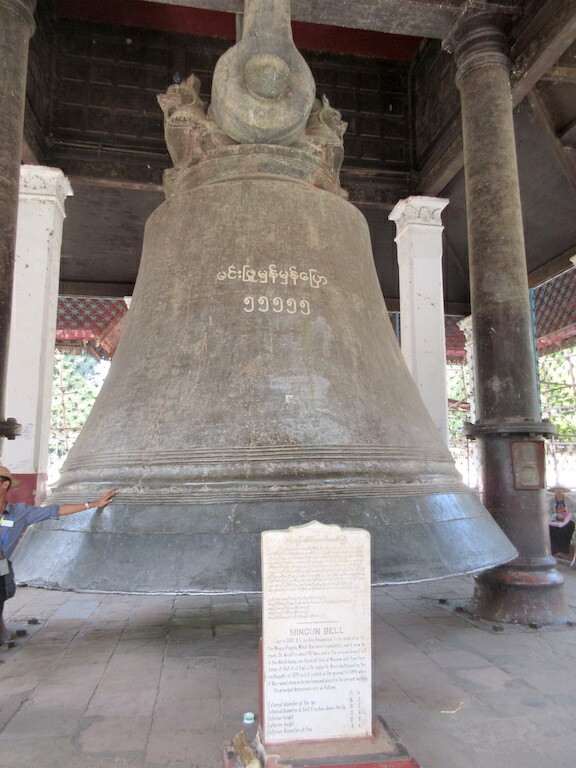 The bell, called the Mingun Bell, weighs some 90 tons and still today is the world’s second largest working bell. The bell unfortunately fell to the ground in the earthquake and was not re-hung until 1898. 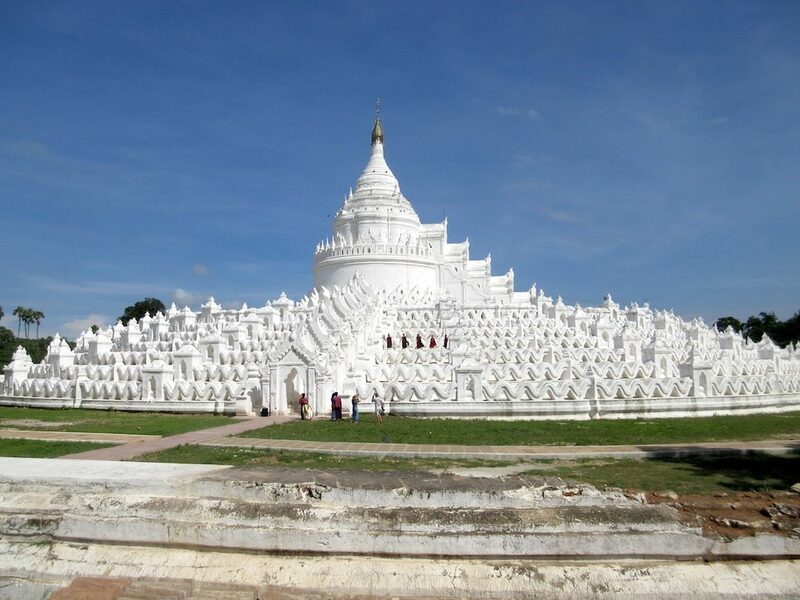 Our next stop was a large white stupa where we climbed the exterior until we reached the mid point of the stupa. From there we took a very steep interior staircase to an observation point, where we could see the river and surrounding area. The entire time we were onshore, it seemed as though we were part of a moving market of sorts. The local young women in the town would follow us through town trying to get people to buy postcards, clothing, fans, jewelry or other items from them. They would be fanning you with a fan, helping you up the stairs all to encourage you to purchase something. At the stupa when had to remove our shoes and socks to enter the stupa grounds and when we returned there was a young woman with our shoes ready for us at a plastic stool, ready to assist us with our shoes. Also at the stupa there were children selling strings of local white or pink flowers for the huge sum of 80 cents US. The locals use the flowers to place at the foot of a Buddha statue inside the huge stupa. We departed Mingun at 11:00am headed back to Mandalay for an afternoon tour of Mandalay. Mandalay is the second largest city in Myanmar with a population of about 2 million inhabitants. 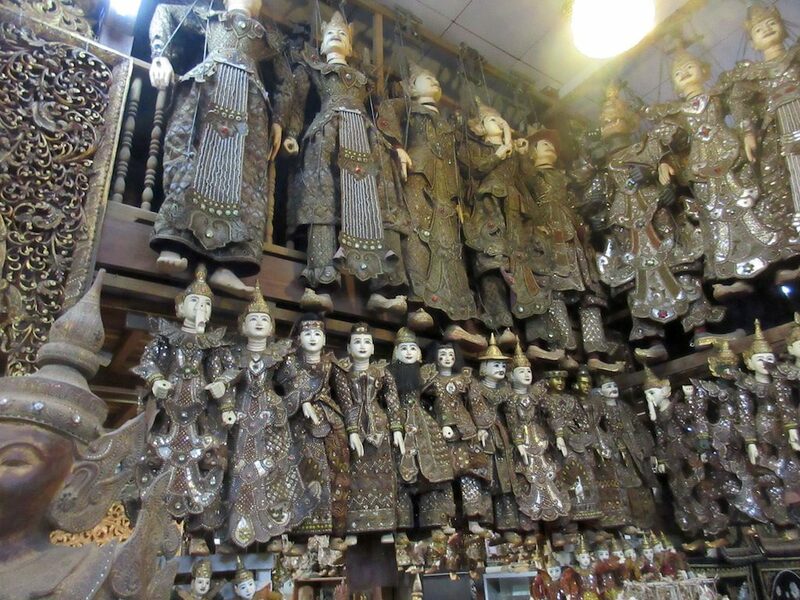 It was the last royal city built by the last of the Burmese Kings. In 1857 King Mindon founded a new royal capital at the foot of Mandalay Hill to fulfill a prophecy of a metropolis of Buddhism on the occasion of the 2,400th jubilee of Buddhism. The new capital was surrounded by four rivers and was about 25 square miles in size. The new capital was built in a block grid pattern anchored by a 16 square block royal palace compound surrounded by a moat. Mandalay was the last royal capital under the independent Burmese kingdom before its annexation by the British Empire on November 28, 1885. During World War II, Mandalay suffered devastating raids and air strikes during the Japanese conquest of Burma. Three-fifths of the houses were destroyed and 2,000 civilians were killed. Many fled the city during the Japanese occupation from May 1942 until March of 1945. The palace citadel was burned to the ground and only the royal mint and the watch tower survived. Mahamuni Pagoda, a Buddhist temple, is a major pilgrimage site, where it is believed that this is one of only five likenesses of Buddha made during his lifetime. According to legend, after the casting of the Mahamuni Buddha was created, the Buddha visited and breathed upon it, and thereafter the image became the exact likeness of the Mahamuni. 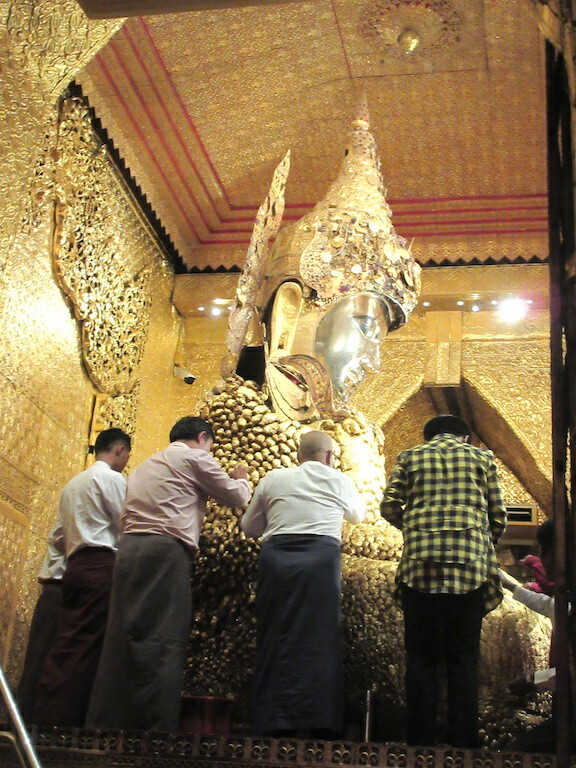 People visit the Buddha and purchase gold leaf sheets to be applied to the Buddha, so after years of applying gold leaf the shape of the Buddha is a bit overweight and somewhat grotesque looking. Only men are allowed within the inner sanctum where the Buddha is housed. The women must look from outside where they also have television screens broadcasting live photos of the Buddha. We also took photos of the nearby temple-strewn Mandalay Hill, upon which the city was founded and named. This 790-foot-tall hill is known for its abundance of pagodas and monasteries, and has been a major pilgrimage site for Buddhists for nearly two centuries. We visited some local artisan workshops to learn about gold leaf and tapestry making, wood and marble carving as well. The process of making the very thin sheets of gold leaf to decorate stupas, Buddha’s and pagodas was unbelievable. Young men use six-pound hammers for hours to flatten the tiny amounts of gold into paper thin sheets able to be applied. Between the paper thin sheets of gold are paper sheets made from bamboo. The process to create the paper sheets takes three years of soaking the bamboo to create a pulp to create the thin paper sheets. After dinner there was a local dance troupe and local music group that performed a Burmese dance performance. They had beautiful costumes and performed a variety of local dances and songs from this region.